Practice Geotechnical Engineering questions and answers for interviews, campus placements, online tests, aptitude tests, quizzes and competitive exams. This set of Geotechnical Engineering Multiple Choice Questions & Answers (MCQs) focuses on “Hydrometer Method”. Explanation: The sampling depth (h) in hydrometer method is taken as 10 cm. Explanation: The reducing reading is designated as RH, which is used for calibration of hydrometer. Explanation: The addition of dispersing agent in water increases its water level, therefore the dispersing correction is always negative. 4. The hydrometer method differs from pipette method on the basis of which of the following? Explanation: In sedimentation analysis the hydrometer method differs from the pipette method in the method of taking the observation. Explanation: Both meniscus and dispersing agent correction are applied to a hydrometer reading. Explanation: The actual reading to be taken at water level will be more; hence the meniscus correction will be always positive. 7. Which of the following is the correct hydrometer reading equation? R = Rh’ + Cm ± CL – Cd. Explanation: The three corrections Cm, CL, Cd can be combined into one corrections Cm and the equation can be written as R = Rh’ + Cm. Explanation: Since the density of the soil suspension is high, the visibility will be opaque. Explanation: The quantity of dry soil and dispersing agent is taken as double of pipette which is 500 ml. Explanation: since the soil is weighed in terms of mass, the volume is taken in terms of grams. Explanation: The hydrometer are generally calibrated at 27°c if the temperature is more than 27°c, temperature correction will be taken negative. If less than 27°c then the temperature correction will be positive. 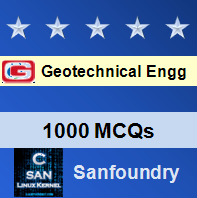 Sanfoundry Global Education & Learning Series – Geotechnical Engineering. To practice all areas of Geotechnical Engineering, here is complete set of 1000+ Multiple Choice Questions and Answers.